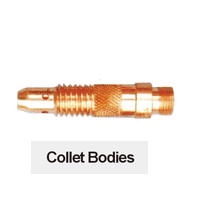 Product categories of Collets Body, we are specialized manufacturers from China, Collet Body, Tig Torch Collet Body suppliers/factory, wholesale high-quality products of 10N Collets Body R & D and manufacturing, we have the perfect after-sales service and technical support. Look forward to your cooperation! The collect body is the connector between the welding collects and the Ceramic Nozzle .It is important in the torch .The collect body has the difference of the length ,the long and the stubby .Different tig torches need different length of the collect bodies .We have four types ,the 10N ,the 17CB ,the 13N,the 11W .The custom can choice based on their need .